We went to Fernbank Natural History Museum last weekend. 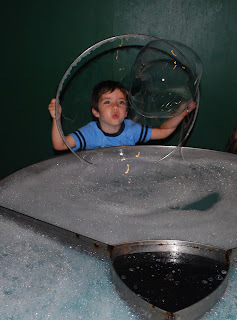 We saw the usual displays of sea shells, dinosaurs, and the interactive science exhibit. There was a temporary exhibit showing dinosaur movement. It think it was meant to prove how everything you see in a Hollywood depiction of dinosaurs is completely inaccurate (i.e., there is no way a Tyrannosaurus could run as fast as shown in the Jurassic Park movies). Fernbank has also recently started small nature trail walks on the Natural History grounds. While there have always been public trails open at the Fernbank Science Museum, the Natural History Museum has only been conducting guided walks for two weeks. After coating ourselves with Off, my family and another family of four set off with two guides as we explored the woods behind the NHM. We learned about poison ivy (I had no idea that every part of poison ivy contains the oils that can cause the familiar itchy rash - the leaves, the stems, and even the roots) and tulip poplars, where Fernbank got its name, and how the museum staff are working to make the trails accessible to the public at large. Despite a couple of mosquito bites, the mini-hike was my favorite part of our excursion. Sounds like you had a great time. Did you also know that you can get poison ivy from an animal, too, such as a stupid orange cat who rubs up on the plant and then your legs? WOW that place is scarily similar to a place out here! Tricky looks just like my niece in that pix!